New guru Mini Marley has only been on YouTube for one year, but in that short time we've watched her subscribers shoot up over one hundred thousand in a matter of months, and we couldn't be happier for her! 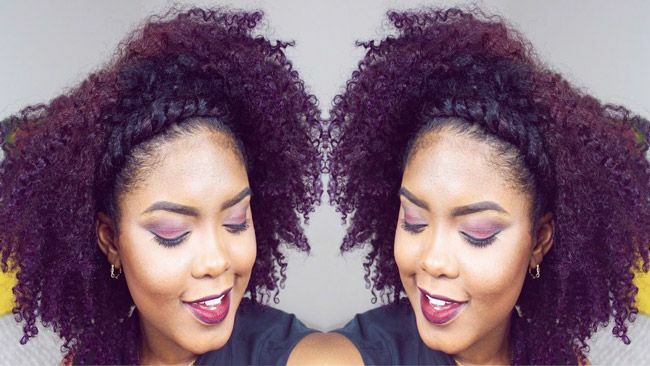 When we saw her recent fro tutorial with a twist, we could totally relate to the desire for a fun new take on your go-to wash and go or twist out - that won't take up your whole morning. Sometimes it's hard to be your most creative self at 7am, so for those moments we recommend you try this hairstyle. If you're working with an old flat twist out or wash and go, start by refreshing your curls with a shine product or finisher. Apply this in sections, massaging it into the scalp and smoothing from roots to ends. Tie hair back, leaving the front "bang" section of hair loose. Apply your edge control product to your edges, combing it down with a toothbrush. Take a 1" section of hair above the left ear and divide it into two, then begin flat twisting towards the face, up and over in the direction of the right ear. Don't worry about making this too tight, if it's loose it will look fuller. Secure the twist near the right ear with bobby pins. Let the rest of the hair down and fluff it out with your fingers.